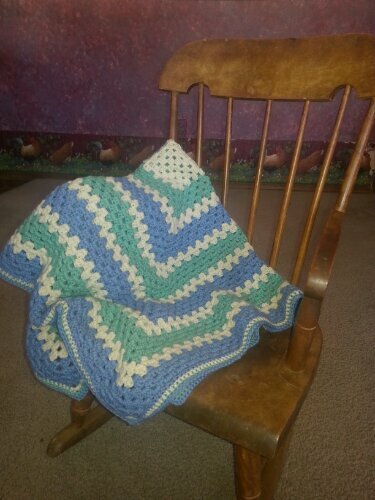 Today the Granny Baby Blanket was delivered to the little store where I sell my crochet items, just in time for someone to need a great little gift! As an avid crochteter, I am so blessed to have a local outlet that will display my handmade items and sell them. 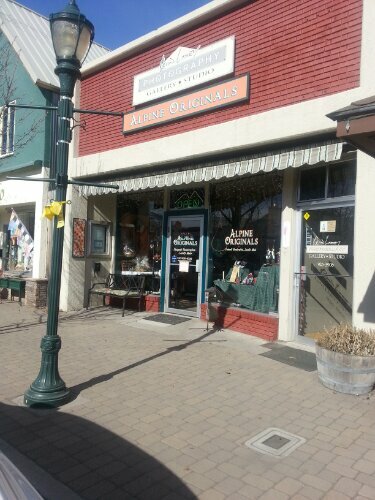 Alpine Originals has supported many local artist and they have a wide range of locally made, handcrafted items… Stop by and check it out if you are in the area (Mt. Shasta California)! As you may know, I started my crochet journey at the age of 10. Learning from one of the best! 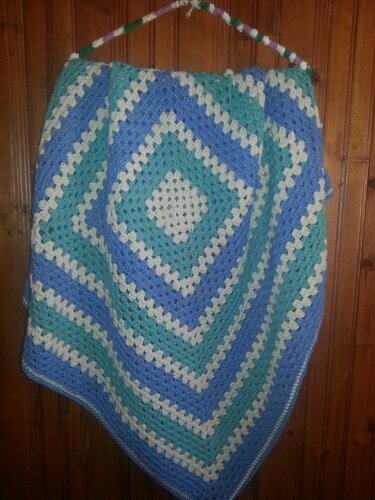 My Grandmother Beatrice Ryan Ramshaw… I loved the way my latest Granny Square Blanket turned out,,, I would have loved one of these for one of my children… But like most moms, I didn’t have much time to whip up a baby blanket in a couple of evenings back then! Great colors for a sweet boy! I hope it finds a great home! I love this pattern due to the simplicity and the beauty all wrapped up into one great project. I don’t mind working from a written pattern, but I much prefer crocheting while watching TV or riding in a car, having to concentrate on a complicated pattern would have slowed down my pace… In just a couple of evenings of a few great shows (Downton Abby) and this blanket was done. The blanket is resting on my childhood rocking chair… It is now rocking its third generation! The next retro baby blanket is now started and I will post it when its is ready to be delivered too! So here is to Retro Baby Crocheting… And back to Downton Abby and Crocheting! Lovely! Thanks so much for linking up on Hookin On Hump Day!